Are You Doing The Right Thing The Wrong Way? 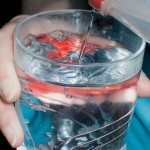 For years, I’ve undertaken a strategy to make sure that I was getting enough water. For years, I was doing it the wrong way. At work, I have a cup that I keep at my desk that gets filled from a container that I keep in the fridge. I like cold water, so I pour water from the container in the fridge into my cup, then fill the other container and allow it cool off. Both containers held about 2.5 cups of water, so if I drank three containers worth per day, I was getting a good intake of water. This seemed to be working, until one day I realized that I was going about the right idea (staying hydrated) the wrong way. What I was doing was drinking a majority of the water in the morning. I’d often be done with all three fill-ups by the time I finished lunch. I was getting up in the middle of the night – This is what really clued me in. I realized that I was waking up in the middle of the night to go to the bathroom, at least once, often twice. When I looked at it further, I realized that I was drinking at least a cup or two of water in the evening, presumably because all the water I drank in the morning had already been processed, and my body wanted more. Once I realized this, I changed my habits. I still drink the same amount of water during the day, but I spread it out, so that by lunch, I’m only about 50-60% of the way through the three fill-ups, and I’m drinking water until I leave for the day. This spreads out my water intake, and keeps me hydrated longer. After making this conscious switch, I realized that I was getting up a lot less in the middle of the night because I didn’t drink as much water in the evening. There you have it, an example of doing the right thing, but doing it the wrong way. This happens with money more than you think. Budgeting – Creating a budget is a great idea as it allows you to track and allocate your money, but if you don’t track things properly, you miss certain categories, or you allocate funds improperly, you could come out no further ahead than before you started budgeting. Investing – It’s pretty much a standard that as you’re working, you should be investing money for retirement. This is a great idea overall, but if you invest the wrong way (not checking the fees of your investments, not having a proper asset allocation, taking too much risk, or taking too little risk), you could be disappointed in your returns. Saving – Whether it be for an emergency fund, a home improvement, or a dream vacation, saving money is always good, right? Well, not if you don’t look at it in the big picture. If you’re stashing money aside but only paying the minimums on your credit card balance, you could be doing more harm than good. I’m sure that the list goes on…. So why do we get ourselves in these situations? 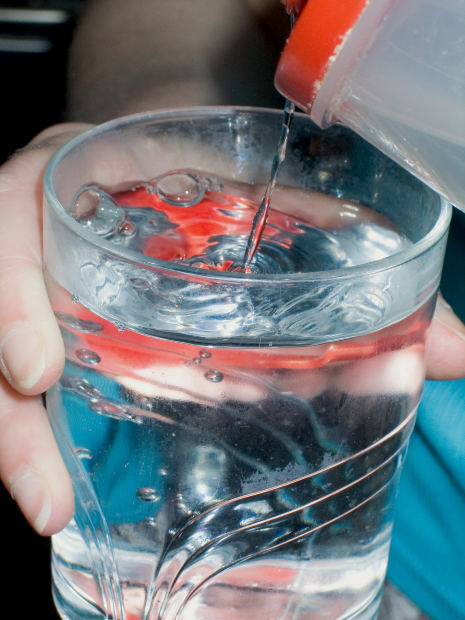 Some of the potential mistakes I outlined above seem like no brainers, just like it probably seems obvious to many readers that drinking a ton of water for a few hours of the day and not drinking much after isn’t the best idea, but it’s not always that easy. Why do we do these things? Mis-information – As I noted above, I had read somewhere that your body would adjust to your water intake. There’s a good chance I read that out of context or maybe from a source that was just flying off the cuff, but I took at as truth and planted the seed in my mind that allowed it to be truth. If someone you know gives you a piece of money advice that worked for them, you may accept it as truth, even if it’s not the best idea for you. Habit – Once you start doing something and keep doing it, the process becomes habit. That can work in your favor as you try to establish an exercise routine, but if you get in a bad money habit, it can work against you. It may seem perfectly normal to spend $200 on dining out a month simply because you’ve done it for so long, but if you’re busting your budget and can’t figure out why, there’s a good chance that you have a habit or two that you’re not considering that could be affected. And how do you get out? If you’re doing a good thing the wrong way, chances are the fix may not be obvious. Don’t give up – If your budget isn’t working, it’s very tempting to just quit the process, figuring that it’s not working anyways, so why bother? Don’t give up. Look for the root cause – In the case of my water intake, the problem that I wanted to solve (getting up in the middle of the night too much) led to the discovery that I was drinking water incorrectly, and it took going back a few layers to really identify the problem. Chances are your budget isn’t the problem, but a spending habit within your budget. You have to be willing to dive a little bit deeper. Ask for help – There are people out there willing to help. If you can’t figure out why you can’t get your investments working the right way for you, then it could be time to ask for help. Ask around to someone you trust if they can help or give you a referral. Think outside your comfort zone – Many people would never think about hiring an investment professional because they think they can do it themselves or are unwilling to spend the money. What they might need to realize is that the cost can be made up quickly if a problem is solved. A $200 fee for an adviser seems high, but if you increase your returns by $1,000 as a result, then suddenly it turned into a pretty good investment, didn’t it? Finding out that you’re doing something good, but doing it incorrectly, can be an enlightening experience, but it’s worthwhile to fix and chances are will make a big difference in your life. For me, fixing my hydration process has resulted in much better and more restful sleep. Readers, what are your experiences (money or otherwise) with doing something right, but doing it wrong? I have a cat that’s fifteen years old. For roughly fourteen of those years, she was the model of perfect health. But, as age catches up to us all, it caught up to her. She has failing kidneys, which is pretty common with cats. The vet advised that I begin giving her subcutaneous fluid injections, which is essentially giving her an injection of liquid under her skin. This helps cats with her problems because the additional fluids in her system makes it a little easier on her kidneys while they do their thing. The vet did the first injection and walked through the process step by step. They made it look easy, but when I got home and started trying myself, the first few attempts were less than stellar. Each time, the cat ended up with fluids, but getting there was often a bumpy road. The IV lines and needles were a struggle to get together and set up properly. A couple of times the needle went under her skin and then came back out, so when the fluids started going, they were merely getting her wet. Some times the needle was in but the drip was so slow that I had to start over again. She struggled to stay in one place, often wiggling away from the towel I had set her on. The first few times saw a terrified, trembling mess….and the cat was usually in pretty bad shape too! But, eventually I kept working at it and it got better. A lot better. I figured out how to inject the needle so that the drip went fast and so that it didn’t double poker her. She let me know that she’d reduce her squirming by 90% if she could sit on my lap instead of a towel. I can assemble the parts and pieces of the IV like a veteran cop assembling his Glock. I got better because I kept working at it. I got better because I wasn’t afraid to fail. I got better because even when I did fail, I knew I was working toward something better. These same lessons apply if you’re just starting off with a budget. Putting together a budget is a painful process. Sticking to a budget is even worse, especially if you’ve not been in that mindset. You’re going to fail or have major bumps in the road. You’re probably going to miss things. You’re most likely going to struggle and have to change things along the way. The important thing is that you don’t give up and that you keep trying, because it will get easier. I promise. The struggles that you have while adopting new behaviors and practice will seem foreign at first, but will seem common down the road after you’ve been doing them for awhile. So, keep working at that budget, and once you have that mastered, well, then I can teach you a thing or two about giving a cat her fluid injections!